Rockeries may have gone out of fashion in the last few years, but where better to revive their popularity than in this garden on the fringes of the Lake District? 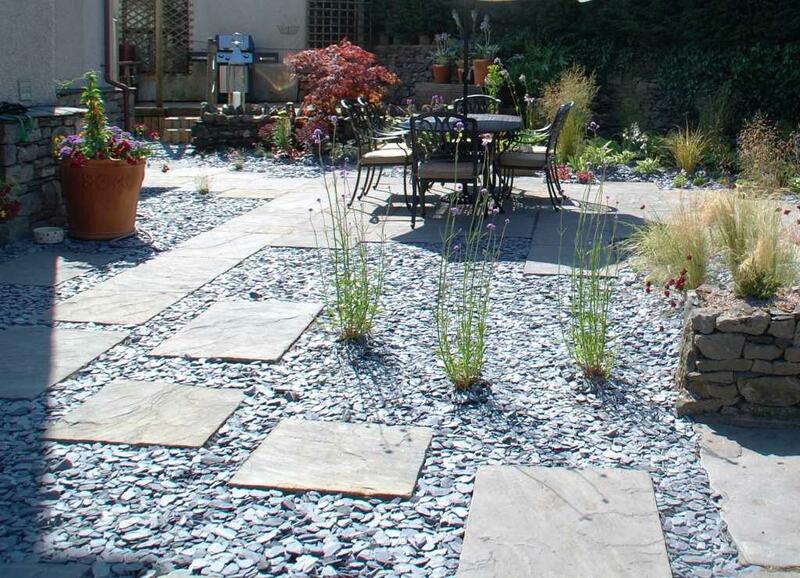 We used ‘Bowscar Red’ sandstone from Cumbria Quarry Services in Penrith for our alpine rockery stone. Not only is it locally sourced, keeping transport costs down, it is in keeping with other stone found in the area. It also has a naturally high silicate content which sparkles in the sunlight. 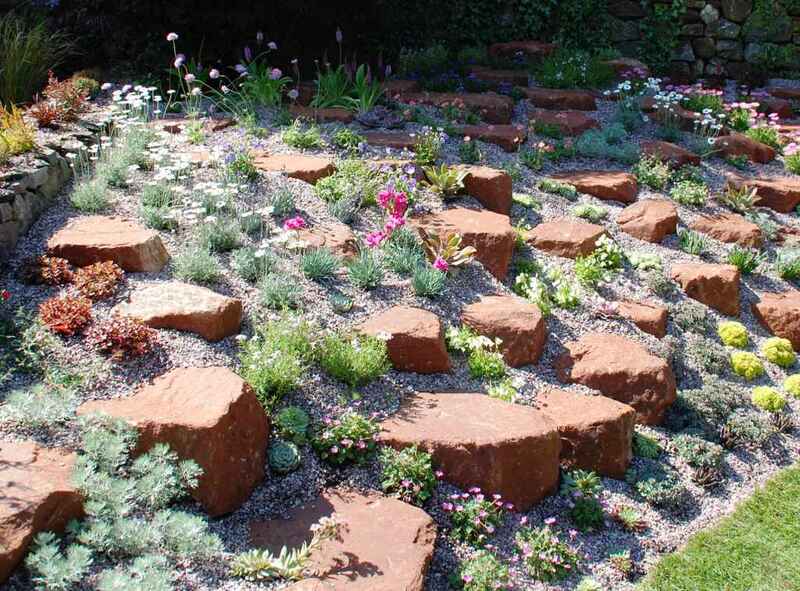 The aim of a rockery is to mimic the conditions found in naturally occurring rocky outcrops, and David Dodd and his team painstakingly placed each piece (weighing upto 75kg) to create fissures and stratification lines. These provide spaces for free-draining pockets of soil, ideal for alpine plants which revel in these micro-environments. One of the challenges in this garden was to make sense of the long, wedge-shaped gentle slope towards the beck at the bottom. 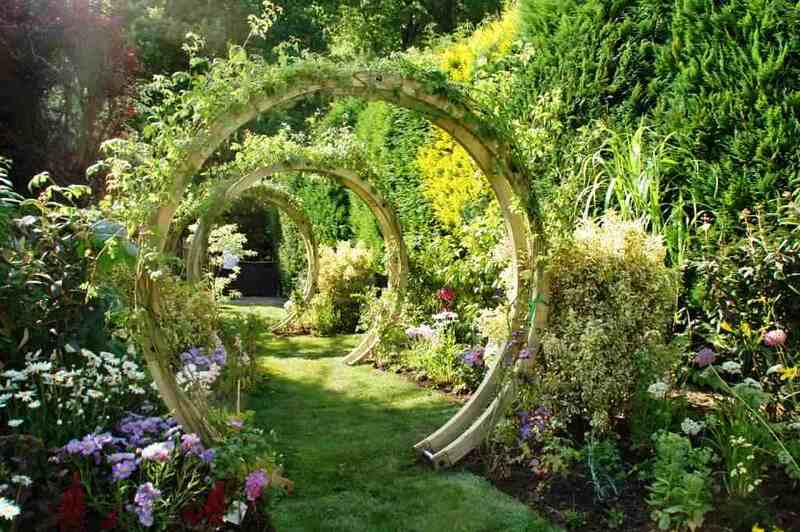 We needed a beautiful garden structure to stop the eye travelling immediately to the far end. We did this by dividing this part of garden into three segments with the use of tall planting but maintained a sense of movement with these wonderful Freestanding Flower Circles from Grange Fencing. Made of pressure treated laminated timber, the circles measure 2.4m across and are guaranteed against rot for 15 years. They either fix directly into the ground with metal spikes, or the spikes can be set in concrete. We knew Millie was desperate for a space she could call her own, a place where she could sit and reflect or just ‘chill’ with her friends. And how better than in this weather-proof contemporary stylish Outdoor Day Bed. Hand-woven from ViroFibre – a specifically manufactured, outdoor rattan-weave – the whole thing is designed around luxury, outdoor comfort with a quirky appeal. It rotates 360 degrees on a sturdy metal runner and has a toughened aluminium frame that even has a fold-down drinks table woven into the interior. With two rattan-weave colours and a number of outdoor cushion colours to choose from it can be integrated with all garden styles to offer a beautiful centre-piece. It even has a woven rattan apple stalk on the top – lovely attention to detail. 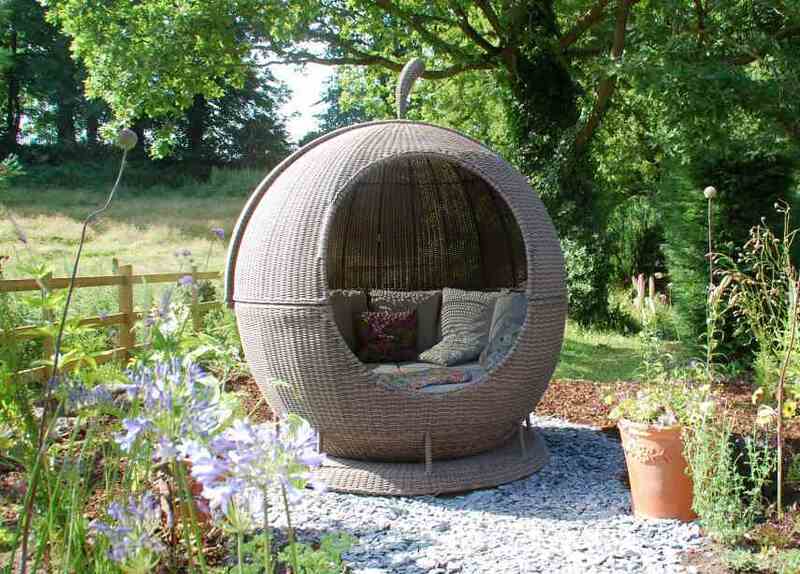 The rattan Apple daybed can easily accommodate two people, and comes in cappuccino or white as well. An additional feature is the removable roof – if you fancy luxuriating in the sun, the top half can easily be removed to catch the sun’s rays. With these great features and superior build quality, this is the perfect day bed for any garden. Alpine Plants If shrubs and perennials are the clothes that make a garden, then alpines are the jewels to adorn the clothes. Their clear bright colours sparkle amongst the rocks, and their delicate forms and foliage belie the fact that they come from mountainous areas and are designed to cope with the harsh, demanding conditions found there. 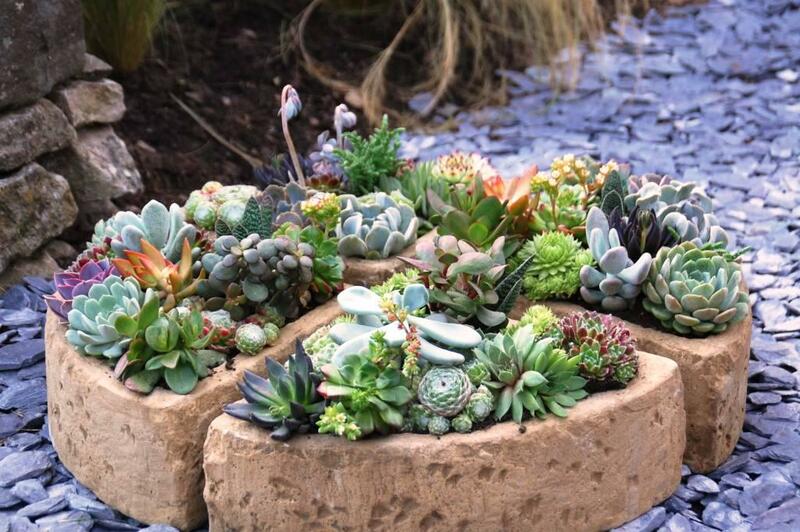 The secret to growing alpines successfully is to make sure that rain drains through quickly and that their roots are never allowed to sit in the water. Some, like Lewisias, are happy growing in the vertical cracks of dry stone walls and will even brighten a north facing wall. The leaves don’t like to be splashed with mud that can remain wet and allow rot, so we spread a layer of fine horticultural grit over the entire rockery to minimise this. Lovania nurseries supplied the plants and the dozens of different species supplied by them can be found in garden centres throughout the UK. We wanted to bring the Lake District into the heart of this garden, and the scree slopes found throughout the area are a typical feature we wanted to echo. Scree is formed by the action of water freezing and thawing, breaking the rocks into ever smaller pieces over the millennia. Not much grows on the slopes themselves, but here in the garden we can plant through it, the blue slate chippings being a wonderful foil for the purples of Verbena bonariensis and the delicate fronds of feathergrass.